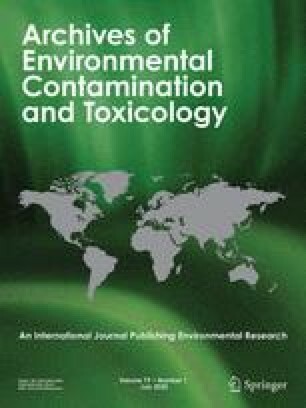 High metal (e.g., Pb) concentrations are typically found in explosive-contaminated soil, and their presence may increase, decrease, or not influence toxicity predicted on the basis of one explosive alone (e.g., HMX). Nevertheless, few data are available in the scientific literature for this type of multiple exposure. Soil organisms, such as earthworms, are one of the first receptors affected by the contamination of soil. Therefore, a reproductive study was conducted using Eisenia andrei in a forest-type soil. Both HMX and Pb decreased reproduction parameters (number of total cocoons, hatched cocoons, and surviving juveniles) individually. Based on the total number of cocoons, HMX was more toxic in a forest soil than Pb, with EC50 of 31 mg kg−1, and 1068 mg kg−1, respectively. The slope of the concentration-response curve was significantly greater in the case of Pb, which is consistent with the possibility that the two compounds do not act on the same target site. The response-addition model was used to predict the response of earthworms and to test for interaction between the two contaminants. The predicted toxicity was not significantly different than the observed toxicity, implying that Pb and HMX were considered noninteractive compounds. The combined action of Pb-HMX may be described, therefore, as dissimilar-noninteractive joint action in a forest soil. The results illustrate the relevance of considering the presence of metals in the risk assessment of explosive-contaminated sites because metals can add their toxicity to explosives. Extension of this study to other types of soil and other metals would improve the understanding of toxicity at these sites. We thank M. Sarrazin and L. Paquet from the Biotechnology Research institute of the National Research Council of Canada and S. Sauvé from the University of Montreal for analytical support. Y. Prairie from the University of Quebec at Montreal is also thanked for his statistical support. We also thank G. Sunahara and B. Lachance for scientific advice and review of an earlier version of the manuscript. Finally, we thank S. Thiboutot and G. Ampleman from Defence Research and Development Canada for their support.